A thick fog this morning and rather cold at present. Hope it clears as I told Rene we would wash. So far I have done no Autumn cleaning and it’s time I did. We had another letter from Ron 16th Oct written on 2nd and Emmie one dated 6th so it is nice to be up to date again. He sounds very cheery in all of them. I wrote him a long letter last night and enclosed a 1944 calendar. We are sending a parcel this week for his birthday, Nov 26, and Xmas. We, at least, Rene got a nice leather writing case, a small one, at Sk[egness]. It has no zip but is very soft leather lined Kid. It cost 17/11. It won’t take up much space in his kit which is the main thing and will just keep his unanswered letters together and perhaps a snap or two. Emmie’s gloves have arrived, she is very chuff and she says he has bought Xmas presents for us all. Do hope they come safely. He is sleeping in a little bivouac tent now with Roy Paget his pal. Hope they have better billets for the winter as I think the nights are very cold. Says there are a lot of little lizards, very pretty and quite harmless which go like quicksilver when disturbed. Mr Wilkinson A.R.P.W [air raid precautions warden] came for his [Ron’s] address on Friday. The B[ritish] Leg[ion] is sending parcels. It is over a year since we saw Ron. I can still see the train pulling out with Ron waving from a carriage window, and how I felt as if he was taking a part of me with him, feeling as if I must strain my eyes for as long as I could see him, knowing it might be that it was the last sight of him we should ever have. Emmie did get to Peterboro’ for a few days and he got to Yea. for a few hours. It is a year since the tide turned for us at Alamein and we won that first big battle on the borders of Libya and Egypt. 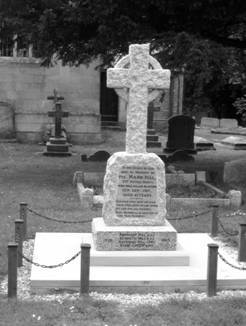 Godfrey Talbot described it on Radio and the white cloud on the desert of 600 white crosses. Now 800 more British have laid down their lives in Italy in just over a month, more than that because that is only 5th Army and then there has been all the fighting in Africa and Sicily. It is a mad, bewildering, world. Keith and Marian are here, it would be a sad homecoming, the first since Raymond’s death was reported. Roy Paget was Ron’s RAF friend in his unit in North Africa and Italy. Mr Wilkinson, here, was very probably the retired policeman, Jack, the father of ‘Spitfire Ace’ Royce Clifford Wilkinson (see 29 May 1943). He used to recount his son’s exploits to Joe Kirk and fellow drinkers in the tap-room of the ‘Vine Hotel’ (see Village Map). Godfrey Talbot was one of the best-known BBC war-correspondents. The ‘Southern Vines’ epitaph was based on lines, slightly changed, from two verses of ‘The Graves of a Household‘ by Liverpool-born poet Felicia Dorothea, née Browne, Hemans (1793-1835). May had copied the original into her ‘Poetry’ exercise book when a pupil at the village school. Jean and Father have departed. I am not working to-day. Rene will probably collect Red + pennies and we will wash tomorrow. Wrote a long letter to Ron yesterday and went to Chapel evening service. Tom preached. He is a good preacher and gives the impression that he has spent time and thought on his preparation. Mary and C[harles] were there. M. looks and sounds worn out with sorrow. We are not wearing black. M of course was in blk with white blouse. I hope she won’t think it heathen but I resolved long since that I would only go in blk for anyone very near and then only for a short time. There is scarcely a home without loss and if all wore black it would have a very depressing effect and that is the last thing that we need. Tom gathered blk.berries and gave them to Jean to take to school for jam for winter puddings. Mr. Sp[endlove] says the jam allowance is totally inadequate for school dinner but that the Gov[ernme]nt would let them have sugar if children brought fruit. It is very windy this morning and is just coming a shower. I expect Ron would like to see it. He says he understands now why the poets write of England’s green and pleasant pasture lands. We had letter from him on Sat. date July 23, and airgraph Aug 11, so had been delayed. Think he would be in Malta then. He had collected bits of wood to make a frame to keep his bed off the ground, tho’ it would not be comfortable. Says he has almost forgotten what its like to sleep on a proper bed. Poor boys, they remind me of little motherless children, tho’ I know they are full of resources and by no means as helpless as we are apt to think them. Father is coming off box at 11 to go to station. Russians are keeping up their advances well. Trouble seems to be boiling up in Denmark and Sweden now. Danes are getting tired of the German yoke which presses ever more heavily. Danish king is kept a prisoner in his palace. Swedes are being severely reprimanded by Ger. press for their own press’s way of discussing the war. I have seen the last few sheaves of a fodder stack thrown out sometimes and the mice, which hitherto the cat has been able to catch one by one and devour, run out in all directions. The cat is so bewildered that most of them get away. Well I think Hitler is getting nearly to that, but I think he will be fortunate if he gets away. I rather think the mice will continue and rend him. Summer seems to have slipped away with our hour of D[ouble] summer time. These last few days have felt very like Autumn, a damp close atmosphere that depresses one. Let’s hope we have a month or six weeks of golden Autumn days yet before winter. It is not Sep. yet so we could get two months fine weather yet. It was open weather until Xmas last year. 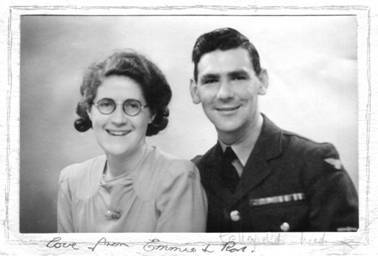 Mary and Charles Hill were in mourning for their son Raymond, recently reported lost in action (see 24 Aug. 1943). Ron had in fact already been moved from Malta to Sicily on 20th July. Over a month since I wrote in my diary. The long light days don’t seem to allow time for writing except for letters and I seem to get more and more to answer these days. Also, Emmie has been 2 weeks Wed. Aug 4 to Thurs 19. She was under Dr. and thoroughly run down but improved wonderfully with rest and sea air. I got out with her as much as I could and enjoyed it. Had a letter from her yesterday. Says she gained 3½lbs. and had been taken off the panel. Hopes to go back to work after this week, which she is spending with Joan Smithurst at Windermere. Sicily has been in our hands some little time and we seem to be preparing to land in Italy unless they capitulate. Mussolini has reached the bottom and resigned. A good while since I said he was at the top of the arc and would for the future be coming down (as a shell from a gun goes up so far then falls to its level) and it has proved so. Ron was in Sicily on Aug. 5 and presume he still is. He had gone from N.A. via Malta and had some days there when he got a few nice swims. He seems to enjoy swimming in Med. I sincerely hope he did not mean he had to swim, but he says so little. We have lost Raymond. He was killed in action on July 11, 2 days after the first Sicily landing. We think he was there. News came Aug 11. It is a great blow to us all. He had been on Mary’s mind lately a great deal, and the shock is great to them. I think he would be 26. Emmie, Rene, Jean and I went to Mary’s to tea two days before the news and she showed us his last photos and we talked of all the boys. He was a fine, good boy, a good son and brother and now he has gone with many a hundred more. When I came from taking Emmie to Will[ough]by on Thurs. and saw the fields of corn all ready for leading, such bounteous crops and all the peaceful countryside, I thought of all the sacrifice that had been made to keep it for us and prayed that we might try to be worthy of it. Down here we know so little of the great sacrifices people even in England are making and we have had none of the terrible sufferings a lot of them have had. Just a few scares and “near misses” as they say in the papers, but so far no one even injured in our little village, tho’ two girls have been hurt at their work away from home. Certainly we are all living under a certain amount of strain and anxiety. I seem to feel a dull heaviness now when I think of Ron, a little fluttering fear creeps in. I do not seem to dare to look forward to the end of the war, there will be so many gaps in our numbers, Hugh Green, Tony, Ken and Raymond. If Ron should go we have no other son. News of the recapture of Kharkov by Russians on the wireless this morning, Stalin keeps determinedly out of war talks. Winston and Roosevelt are in Quebec discussing situation. Finns trying to start negotiation for peace with Russia. Japs being pushed back. Woodhall Spa was smashed badly last week, 2 land mines dropped and caused a lot of damage, few casualties. 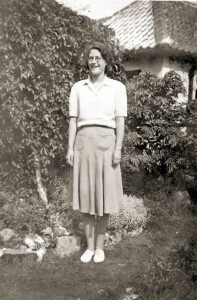 The photograph of Emmie was taken in the garden of Rene’ and Tom’s bungalow in Sunningdale Drive, Chapel St Leonards (see Village Map). Raymond Hill was 26 when he died in action on 11th July 1943 as an army private serving in the Northamptonshire Regiment, 2nd Battalion. 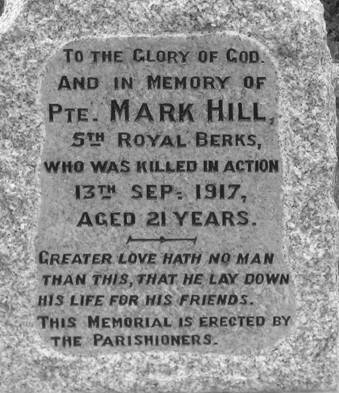 His official memorial is at Syracuse, Sicily and he is honoured on the Chapel St Leonards village memorial. (Some information from Commonwealth War Graves Commission Casualty Register.) May’s epitaph was probably inspired by AE Housman’s work A Shropshire Lad. ‘Leading’ refers to leading the horse-drawn wagons loaded with sheaves of corn, from fields to farmyard. Kharkov in the Ukraine was first recaptured by the Russians in February 1943, re-taken by the Germans in March and again recaptured by the Russians in August. Woodhall Spa had a bomber airfield. The ‘Petwood Hotel’ in the town had been requisitioned by the RAF and was used as an officers’ mess for 617 ‘Dambusters’ Squadron after it moved to nearby RAF Coningsby from Scampton in August 1943 (and later to Woodhall airfield).